Riggghhhhhtttt? I’m not usually one to toot my own horn, but I love him so hard. And that sounded dirty. Whoops! 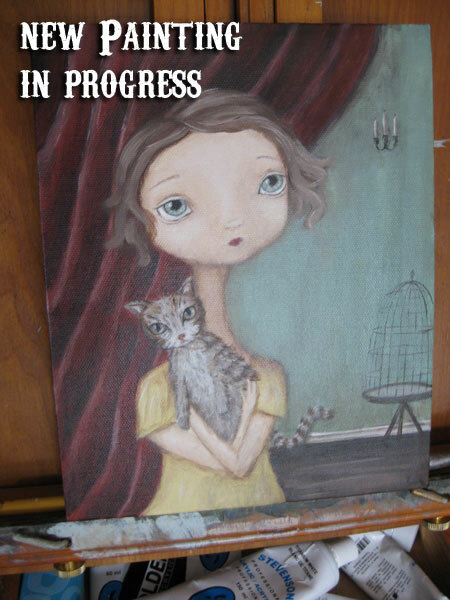 Changing the subject – I have a new painting in the works too and will hopefully have her finished off tonight. Any suggestions for a name? If I can get her scanned and UV coated over the next couple of days, she just might make an appearance at my next market – the Kitsilano Farmers Market on Sunday, June 3rd. The Kits Farmers Market runs every Sunday until October 21st from 10am to 2pm. It takes place in the parking lot of the Kitsilano Community Centre – 2690 Larch Street at 10th Avenue. I won’t be there every Sunday (& definitely NOT in October! ), but if this is in your neighborhood, do pop down to visit and grab some yummy locally grown produce at the same time! Did you already name her? I first thought of Emma, but maybe something more old fashioned — Violette? Adelaide? Ohhhhhh I *love* Adelaide! It feels like some of the more old fashioned names are making a comeback, doesn’t it? Emily and Olivia were some of the most popular names of 2010 babies! Well, hopefully! I like different names, but I fear that we’ve forgotten some really beautiful ones!